After a great start, the wheels are starting to fall off Maurizio Sarri’s Chelsea. On the face of it, things aren’t really that bad compared to last season – sure, the Blues have suddenly suffered two defeats in quick succession after a long unbeaten start, and they’re chugging along nicely in the Europa League. But take away the low-calibre opposition Chelsea are facing in Europe’s second-tier club competition and Sarri’s side have just four wins in their last ten Premier League games, slipping from being genuine title contenders and playing some of the slickest football in Europe to just fourth in the table, ten points off leaders Manchester City, and looking clueless in a number of areas on the pitch. Let’s face it, the Kante experiment isn’t really working, is it? The Blues’ fast start, with the likes of Jorginho, Mateo Kovacic and even Ross Barkley clicking into gear beautifully rather masked the fact that Kante has been bizarrely switched to a more advanced role even than that enjoyed by Paul Pogba, an actual attacking midfielder. The France international is one, if not the very best defensive midfield player on the planet right now – a defender’s dream to have in front of a back four or three. Time for Sarri to try something new, and give that shaky defence a little more protection from one of the best in the business. Can Eden Hazard up front really be any worse than Alvaro Morata and Olivier Giroud? Until signing a new one in January, there’s not much else Sarri can do about Chelsea’s striker problem apart from giving Hazard a chance up front. The Belgium international has played there before, albeit with mixed success, though one imagines he would have rather a different time of things in that position under Sarri than he did under Antonio Conte. At the moment, playing out wide simply isn’t getting the best out of Hazard, with the 27-year-old failing to score in his last seven games in a row for CFC, but a different set-up could put him in better positions to finish off the kinds of chances Alvaro Morata and Olivier Giroud are wasting. A number of senior Chelsea players aren’t really earning their places right now, with David Luiz and Willian perhaps the biggest culprits. As ever, the Blues have a large number of top young talents waiting in the wings barely getting the playing time they deserve, and one imagines if they’ll end up going down the path of the likes of Mohamed Salah and Kevin De Bruyne, moving on and ending up strengthening major rivals somewhere down the line. Ruben Loftus-Cheek is one who deserves a key role and seems to be getting more of a look-in, while there’s also a case for Callum Hudson-Odoi coming in in place of Willian more. As for Luiz, how bad as he got to get for the immensely talented Andreas Christensen to get more of a chance at the back? Gary Cahill surely has more to offer than this? 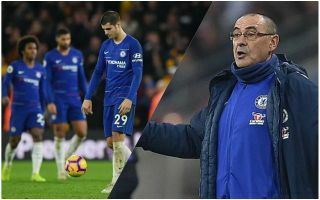 Recent media speculation suggests a number of players who formed the spine of that superb Antonio Conte side of two seasons ago could soon be on their way out. Gary Cahill and Cesc Fabregas’ futures look in serious doubt after barely featuring this season, while Victor Moses has also been rather unfairly frozen out this term. All three were among Chelsea’s most important players in 2016/17, even if Fabregas only really cemented his place in the team in the second half of the season, or shone from the bench. Cahill may not be able to play at the highest level every week now, but his quality and experience is surely worth the odd run out, while Moses is a useful option either at full-back, wing-back or as a wide-forward, surely meriting more attention than he’s been getting? One thing that’s been so impressive about another new manager this season, Arsenal’s Unai Emery, has been the way he responds to games and makes the necessary changes. Remarkably, the Gunners are actually yet to lead a game at half time this season, but keep on improving in second halves, with Emery not afraid to change personnel or even his system midway through the game. Sarri, meanwhile, seems very set in his ways and unrelenting from his philosophy. His subs often lack imagination, simply replacing like for like, rather than, for example, perhaps shifting to a 3-4-3 formation that was so successful for Chelsea under Conte just a short time ago? Might this be a way to coax some better form out of players like Luiz, by putting more centre-backs alongside him, or Marcos Alonso, by giving him more attacking freedom and creating more width?